This is a fun Spring breakfast to enjoy on a weekend morning! The carrots give these waffles a pretty pale orange color, but picky eaters won’t even notice the carrot in them. 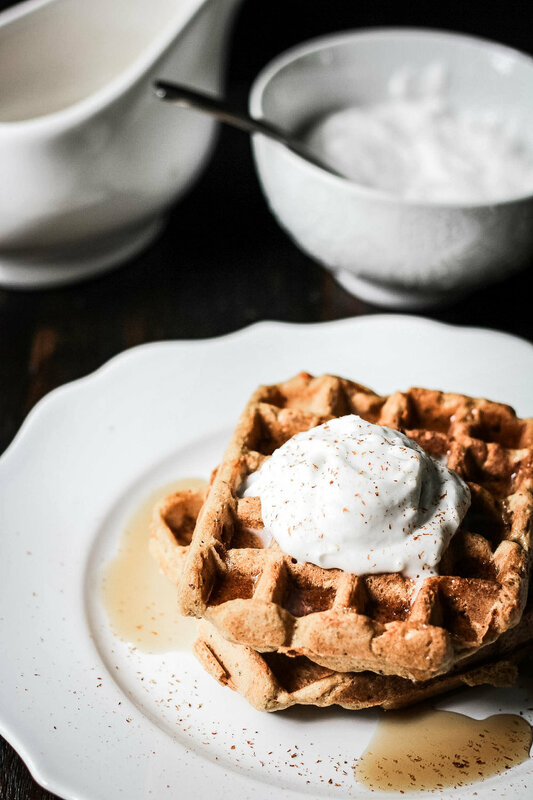 I love topping these waffles with fresh coconut whipped cream and some freshly gound cinnamon. In a large full, mix the flour, baking powder, flaxseed, and cinnamon. In a medium bowl, combine the grated carrots, almond milk, coconut oil, vanilla, and maple syrup. Fold the carrot mixture into the dry ingredients and stir until just combined. Scoop an appropriate amount of batter onto your waffle iron and cook until the edges are slightly crisp. Serve hot with warm maple syrup and coconut whipped cream. Older PostBrighten Your Space with Fresh Flowers!